Oh breakfast baps, we've had a few, but then again, they're often the mainstay of your basic caff. This is No Bad Thing. Mix and match your bacon, your egg, your sausage, choose a condiment, bish bosh. You may prefer your manwich among the manly menfolk milling at Bourne Bridge. Come into our university town centre and sophistication levels soar, what with tablecloths and cutlery and artworks. No wonder Waitrose are waiting in the wings. 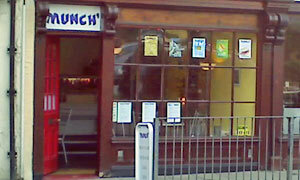 We lunch at Munch, was my suggestion to Andy. New place, only been open for couple of months, next to Caffe Basso, quite literally: Basso at 18, Munch at 20. Wall has local theatre posters plus 8x6 photos for sale (nod to Bonnet) of (a) local scenes and (b) creatures. Unless I'm missing something, I couldn't spot the obvious link to that dead famous Norwegian symbolist painter. Only as many tables as Frankie's tribes since most business is takeaway. Daily M**l safely moved to the other table, I grab a seat, sip a Fat Coke and pester Mr Munch for the router password. Free Wifi, active on Twitter, well done. Still sad and solo after five mins, time to order: Take On Me, look no further than "breakfast baps served all day". B, S & E, ketchup, white roll, ta very much. Most serviceable, generously filled and top value too. Captain Carbon rolls in a good 15 minutes late, competitively anti-punctual as ever. As he's choosing his own BB, I'm admiring the cakes, a selection that wouldn't be out of place upstairs at Berridges. Lemon drizzle, ginger, choc sponge, fruit cake. Proving the pools panel right, Victoria sponge wins, again. Half a point removed for being served on a paper plate. Good coffee on the side, unusally described as a "rich and aromatic latte". So: independent, open early, WiFi, papers, local flyers, good savoury and sweet stuff, and allegedly haunted by a monk (The Scream again?) from the nearby friary. Pop in, say hello, buy a bap and get into the habit. If it was a car -- Think City. If they were passing by -- Christian Slater.